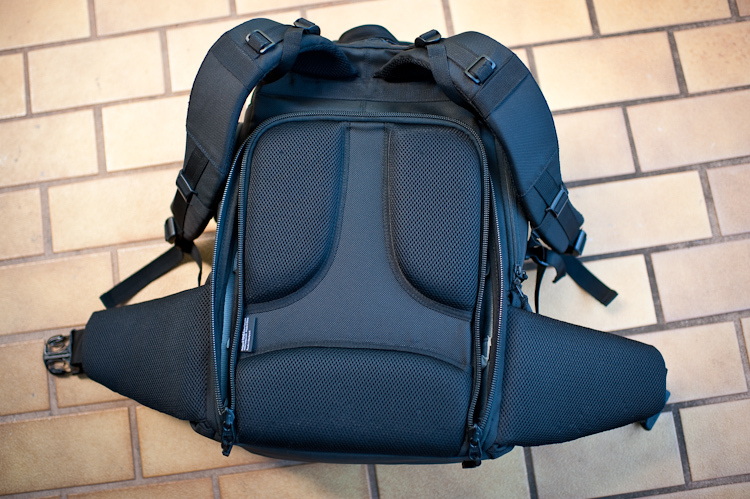 Tenba Roadie II Backpack Review | Observe. Compose. Capture. 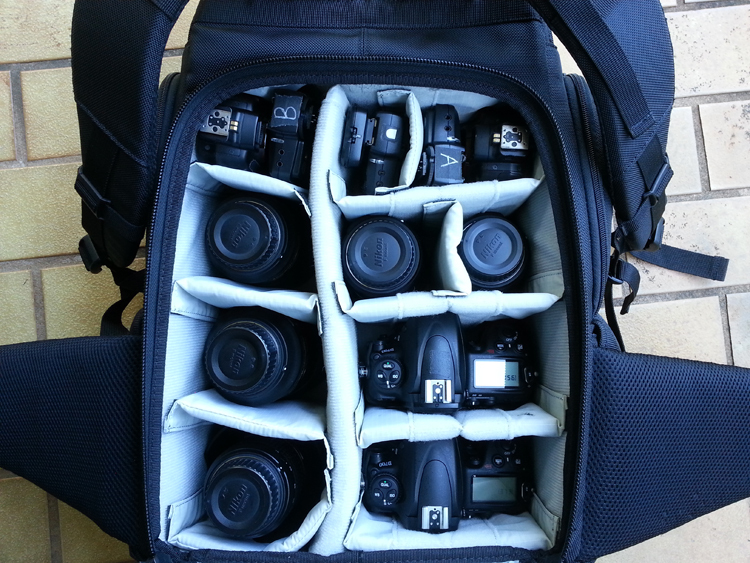 It's not if your gear will outgrow your camera bag, but when. I found this happening to my Kata 3N1 20 backpack that I had gotten a couple years ago. It used to be able to hold all my cameras and lenses for wedding assignments, but after my upgrade to FX, I began to realize that the Kata was too small for the job. I will tell you that the research that followed was nothing short of obsessive. I read tons of blogs, reviews, articles, and checked out all of the major camera bag companies (Lowepro, Think Tank, Tenba, Incase, Kata, etc). What I needed was a bag that could fit my wedding arsenal (2 bodies, 5 lenses), and supporting accessories (SB900s, Pocket Wizards, memory cards, batteries, etc). I needed the bag to be weatherproofed (rain cover a must), and it needed to be comfortable to wear and take around. 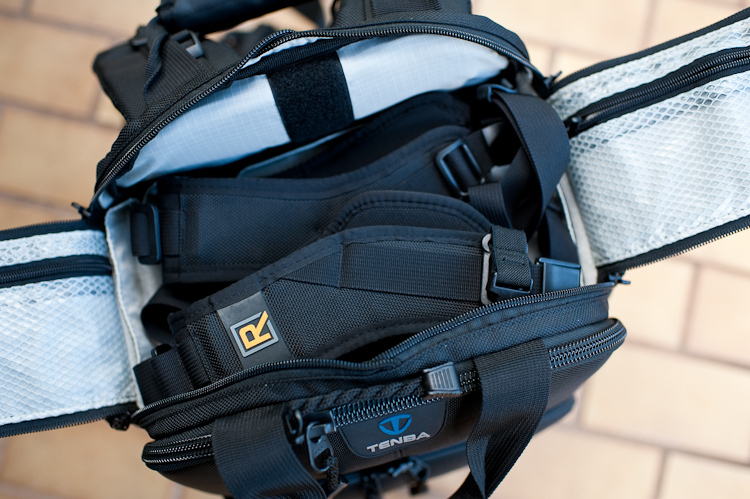 I eventually narrowed down my choices to the Tenba Roadie II backpack, the Lowepro Vertex 200, the Incase Pro Pack, and the Kata Bumblebee. The catch was that none of these bags were available in local stores, so I had to go off of what I saw online, which was pretty risky. 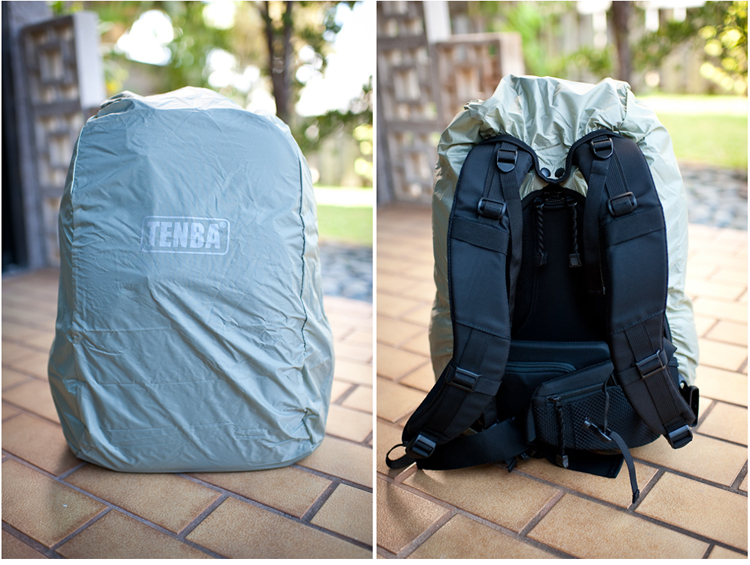 I was leaning towards the Tenba Roadie II, since it seemed to be the most well rounded out of the bunch. 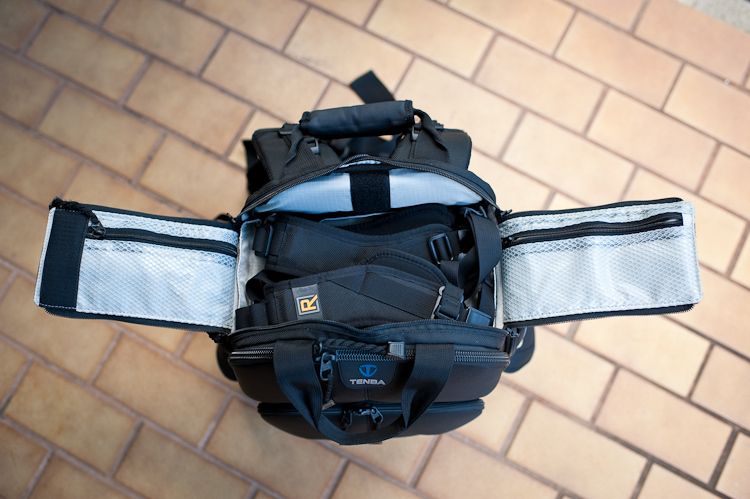 Fortunately, my friend (and talented videographer) Jack, bought the Tenba Roadie II for himself, allowing me to examine the bag in person before I bought anything. Within a few minutes of examining the bag, I was sold, and decided to get it. The review that follows is a reflection of over 3 months of use in the field. 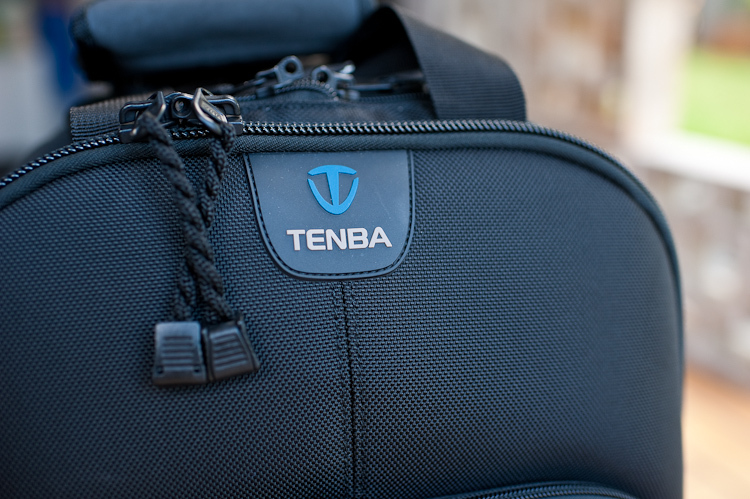 One thing I admire about the Tenba Roadie is that it doesn't looks like the typical camera bag. It has a very simple appearance, and its black color masks its size. The main camera compartment can only be accessed behind the back panel, which makes it more secure when walking around in a crowded environment. 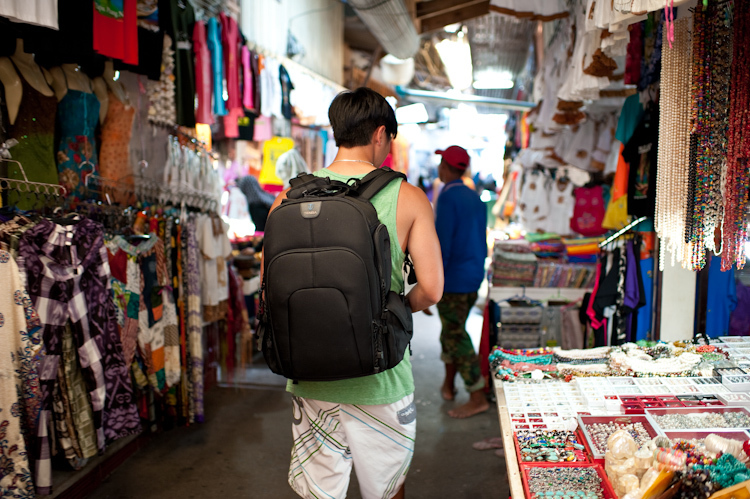 The bag has an expedition-grade strap and harness system that is really comfortable, once you snap everything in. 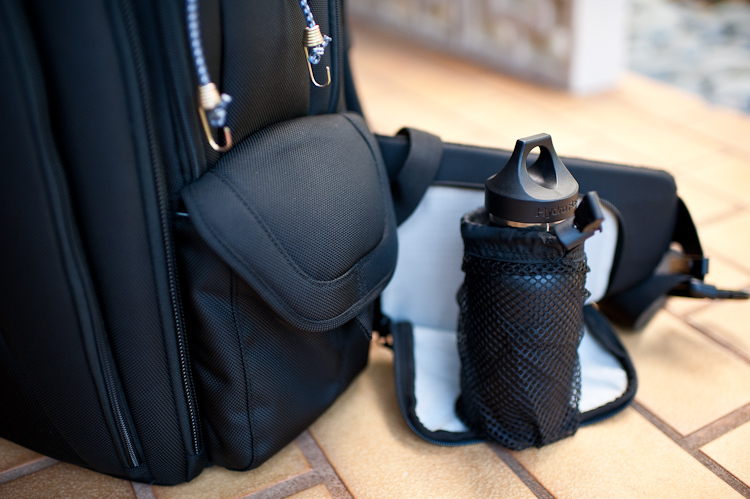 The backpack also meets international airline carry-on standards, and in most cases, will even fit under the airline seat. This is one of the main reasons why I bought this bag. 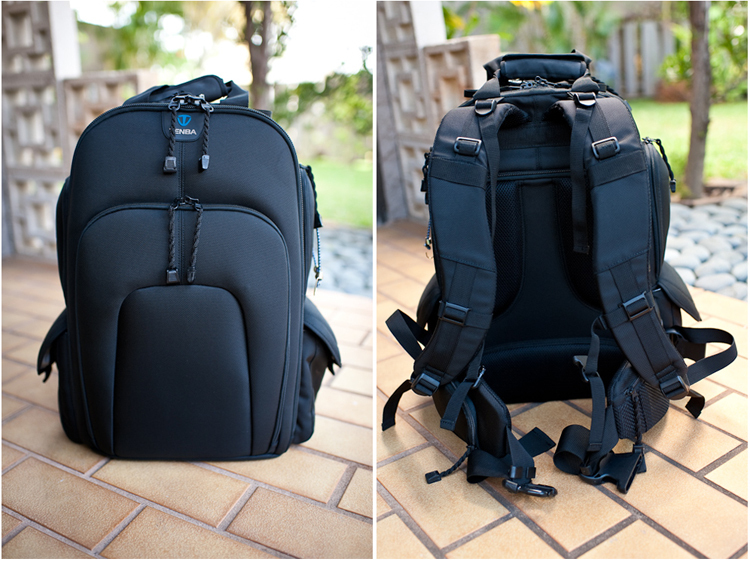 It's easily the best built camera bag I've owned, and I've owned a lot! 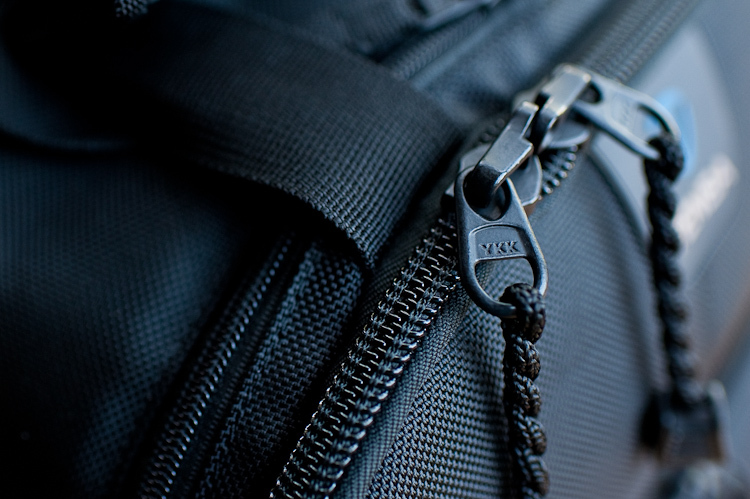 The bag's outer shell is made from water-resistant 1680D ballistic nylon, and all the zippers are all made by YKK. The Zippers also have locking loops on them so you can secure your bag with TSA locks if needed. I forgot to include a picture of it, but the bottom of the bag has a waterproof covering that protects the bag when placed on a wet surface. The expedition-grade harness is very comfortable, and although all the straps can get in the way at times, it gives you the option of tightening almost every aspect of the harness system. 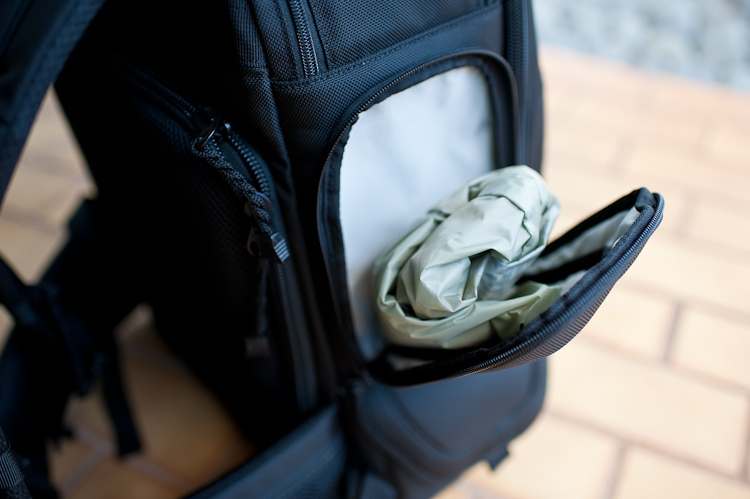 The carrying handles atop the bag are padded, and can be attached or detached. I found the carrying handle a bit awkward when the bag is fully loaded, but it gets the job done. The shoulder straps are very well-padded, and along with the waist straps, make you feel like you're not carrying as much as you really are. Yup, it's a big deal to me. As a wedding photographer, I have no idea what kind of conditions my bag may be exposed to, so having a rain cover was a must, whether it is to keep out rain or sand from my gear. Tenba designed a really solid rain cover. It has button clasps which anchor the rain cover around the shoulder straps, instead of just having an elastic band around the top of the bag. The rain cover also functions as a decent heat shield, especially considering that the bag is all black and will get really hot if left out in the sun. 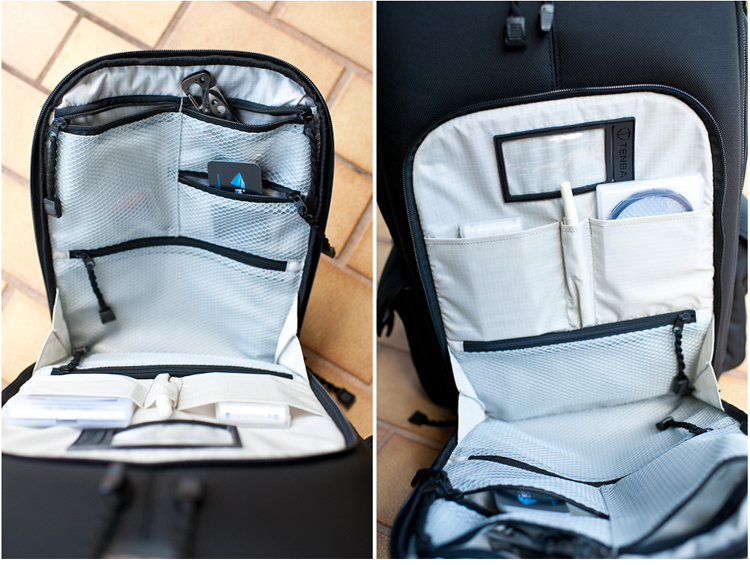 The backpack has a well-padded laptop sleeve that can fit up to a 17 inch MBP. 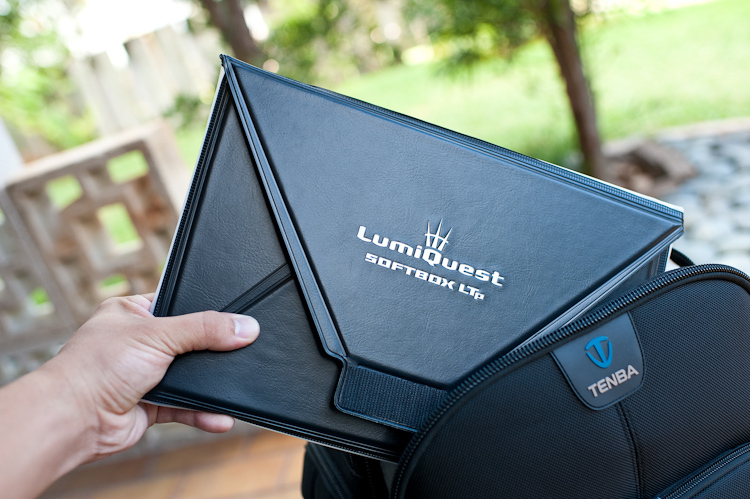 I don't take a laptop with me to shoots, so I have the Lumiquest LTP softbox, my favorite light modifier for strobist lighting at weddings, in that sleeve. A slight modification that I made to the bag was to add a bungee cord to the side of the bag (thanks to a loop on one of the zippered compartments). 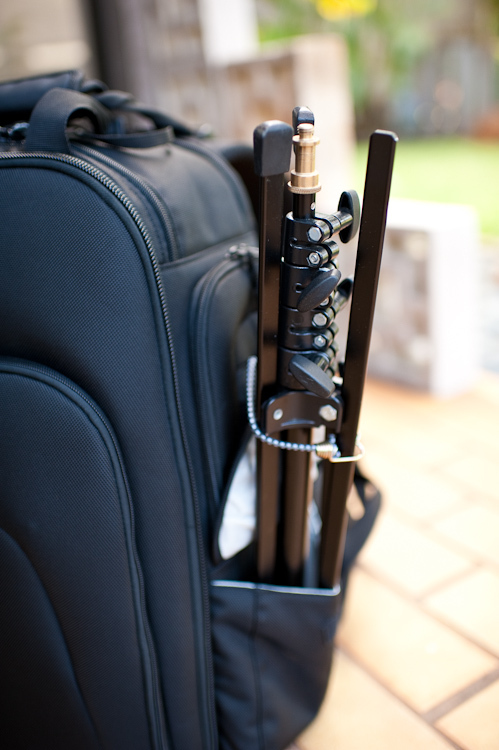 This allows me to secure a nano stand to my backpack, when I'm shooting a wedding solo, without a lighting assistant. One side of the waist belt has a foldout water bottle holder. It's a space saver for the design, but it's not quite effective when the bag is laying on its side, as I'm always afraid my bottle may leak and spill water into my bag. On the flip side, it's very easy to access when you're walking. As I mentioned earlier, the main camera compartment is only accessible through the back panel, which makes it more secure when walking in crowded areas. 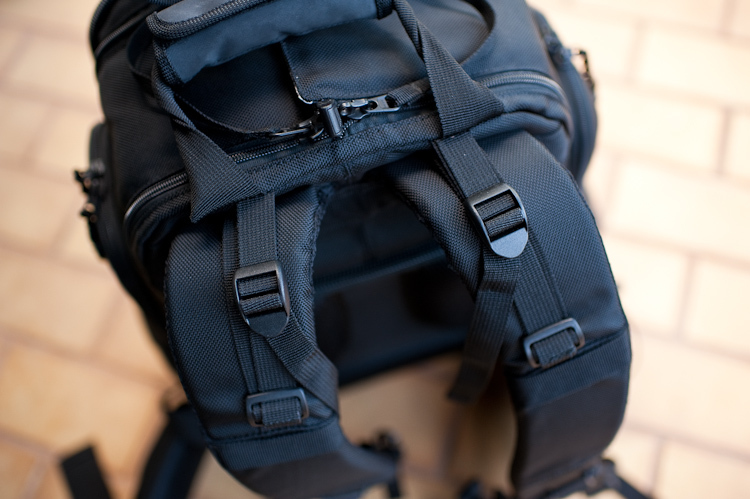 The back panel and waist belt have mesh padding, which helps to wick away moisture when you have the backpack on. While I appreciate the mesh padding, it seems to be easily frayed on clothing. If you look closely at the lower part of the back and panel and waist belt, you can see the mesh already starting to fray, and I've only owned this bag for 3 months. On another note, the back panel also has a plastic insert inside of it, which helps to retain the structure of the bag while it is being worn. Another good thing about this bag is that it can stand upright on its own, even fully loaded. The rectangular base helps to keep the bag from tipping over like other bags I've used in the past. Here is the main camera compartment empty. The bag comes with a TON of dividers (I have a couple extra that aren't in the bag). One thing to note is that none of the dividers, even the middle column, are attached to the bottom of the bag, which is all nylon. There is only velcro on the sides of the bag. The great thing, however, is that this bag does exactly what I needed it to do: carry my entire wedding photography setup with me. It's hard to see in this photo, but this bag is DEEP. It swallows up my D700s, and can easily fit a D3 or D4. All of the lenses, except the 24-70, have their lens hoods deployed (I like to be able to just grab my lens out and start shooting). This bag has more pockets that I know what I do with. This main storage compartment gives you a ton of options to store accessories. I've got a Leatherman, business cards, Expo Disk, pen, and AA batteries, and it looks empty lol. The only downside is that the pockets are covered with a very opaque plastic material that is hard to see through. Also, I had a really hard time fitting a business card into the black sleeve in the image on the right, so I gave up. The top access compartment is really interesting. 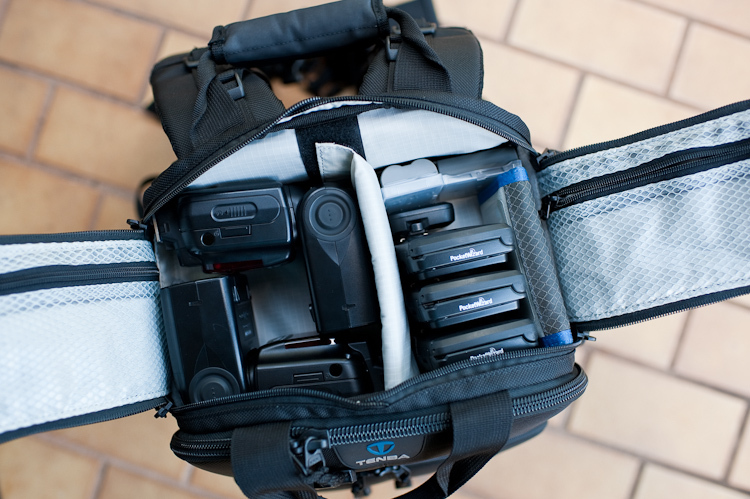 It's designed for audio gear, like audio recorders, wireless mics, headphones, cables, etc, but I use mine to store my Black Rapid double straps, since it is so easy to access. 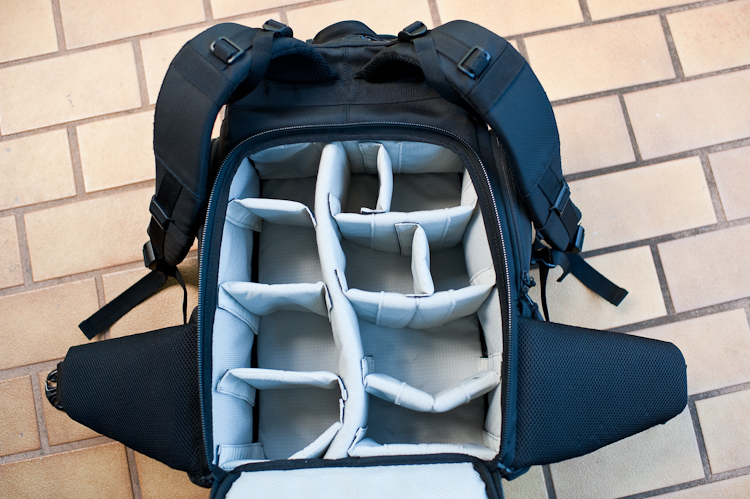 The bottom padding of this compartment can be removed, if you want to store a long lens (300mm) standing up in the bag, and need the extra space. I also figured out how to configure my speedlights, Pocket Wizards, batteries, and memory cards in the top access space, in case I need to put more stuff in the main compartment. --Well built. Tough exterior, YKK zippers, generously padded interior, and weather cover makes this bag a tough cookie. --Lots of pockets for organization...more than you know what to do with lol. --Comfortable to wear...waist and shoulder straps distribute the weight evenly across the body. --It can carry A LOT of gear...I able to fit 2 bodies, 5 lenses, 2 flashes, 3 pocket wizards, and a bunch of other accessories with room to spare. --Simplistic design doesn't scream camera bag. --Heavy if loaded up completely...we're talking 30+ lbs! --Expensive...$300 is quite pricey for a bag. --mesh on the back panel and shoulder straps frays/tears easily. --water bottle holder is innovative, but not very practical. Despite the cons, I really appreciate this bag. I've been using it for 3 months, now, and it does what it's supposed to...transport all my wedding gear from point A to point B safely and comfortably. Thanks for reading! Feel free to comment below with any questions or feedback!